Allegheny County has included resources for the Implementable Comprehensive Plan in its updated website for “Allegheny Places,” the county’s comprehensive plan. The state Department of Community and Economic Development and Pashek Associates pioneered the Implementable Comprehensive Plan. This model of planning emphasizes noticeable and tangible change in the issue areas that citizens find most pressing and most do-able. The main goal of an Implementable Plan is to kick-start desired change in a community – not so much to produce a thick comprehensive plan book. 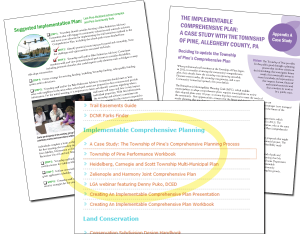 The Allegheny County planning toolbox web pages highlight recent plans Pashek Associates created with various communities, and a “case study” of the firm’s collaboration with The Township of Pine. Pashek Associates currently is working on Implementable Comprehensive Plans for the City of Jeannette (Westmoreland County), and Crafton and Ingram boroughs (Allegheny County), and is about to begin working with Churchill, Monroeville and Wilkins Township for a multi-municipal implementable plan.